CS Unitec’s Trelawny™ Long-Reach Scrapers feature one tool with multiple applications. * Not all accessories shown in above image are included with tool purchase. Contact CS Unitec for more information. 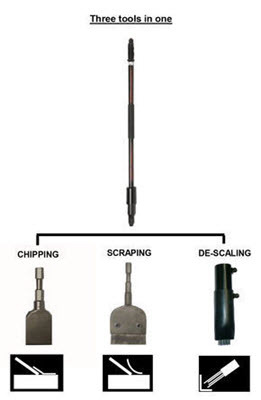 All long-reach scrapers are available as needle scalers by changing the scraper/chisel with the needle attachment P/N 415.3532. CS Unitec's selection of needles can be found by clicking here.